1. To start, pour a gallon of milk into a heavy-bottomed, non-reactive, 6-quart pot. (I like my enameled Le Crusette pot for once-a-week yogurt-making.) Slowly heat the milk to 180F. This is the temperature which will kill off any bad organisms, while creating a sterile environment in which the yogurt bacteria can grow. 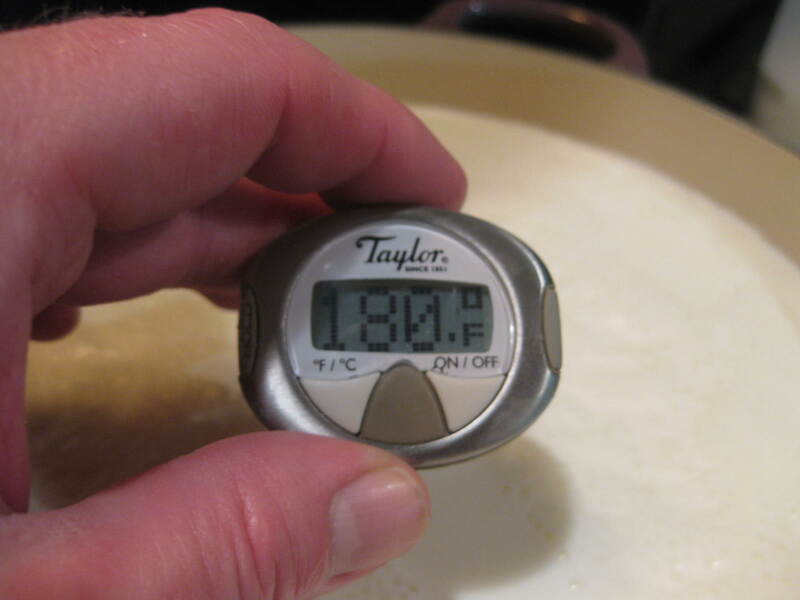 The moment the milk reaches 180F, move the pot to a cooling rack, and let the milk cool, uncovered, to 110F. You want the milk to be warm enough to encourage the yogurt culture to grow, but not so hot as to murder the culture. Yes, I’m giving you not just a recipe here, but a science lesson. A science lesson you can eat. 2. 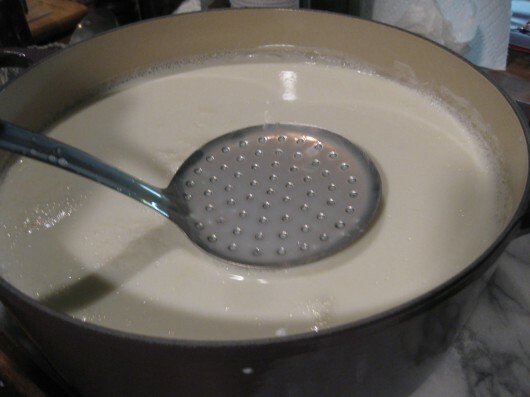 Ladle into a small bowl a 1/2 cup of the warm (110F) milk. Then mix into the bowl the “starter” — 3 tablespoons of plain, store-bought yogurt which contains live, active cultures. Do not add more than 3 tablespoons of yogurt, or you’ll be sorry. Yogurt bacteria does not appreciate being crowded, and adding too much will thin, not thicken, the milk. And by the way, if you plan to make yogurt regularly, you will never need to buy commercial yogurt again. Just save 3 tablespoons of your homemade yogurt, and use that for your next batch. Pour the milk-and-yogurt starter into the big pot. Then, with a slotted spoon or slotted spatula, stir the milk for 30 seconds. Stir with an up-and-down motion, just as you do when making mozzarella. 3. Here’s the only tricky part. The milk must be kept between 105F-110F for the next seven hours. You can wrap a towel around the pot and place it your oven, with no extra heat except that of the turned-on light bulb. Or, do what I do, and place the pot on a heating-pad, set to the lowest setting. For extra insulation, place a bath towel over the pot. 4. The next morning (assuming you made this at night), remove the bath towel and lid, and voila! — you’ve got yogurt. But it ain’t Greek-style until you drain off some — though not all — of the liquid, or “whey.” To do this, lay a piece of butter muslin or a cloth napkin in a colander set over a large bowl. Pour the yogurt into the colander, and let it drain until a thick (but still very creamy) texture is achieved — 1 to 2 hours. What to do with the leftover whey? Save it! Then you can use it in place of water during your next bread-baking adventure. 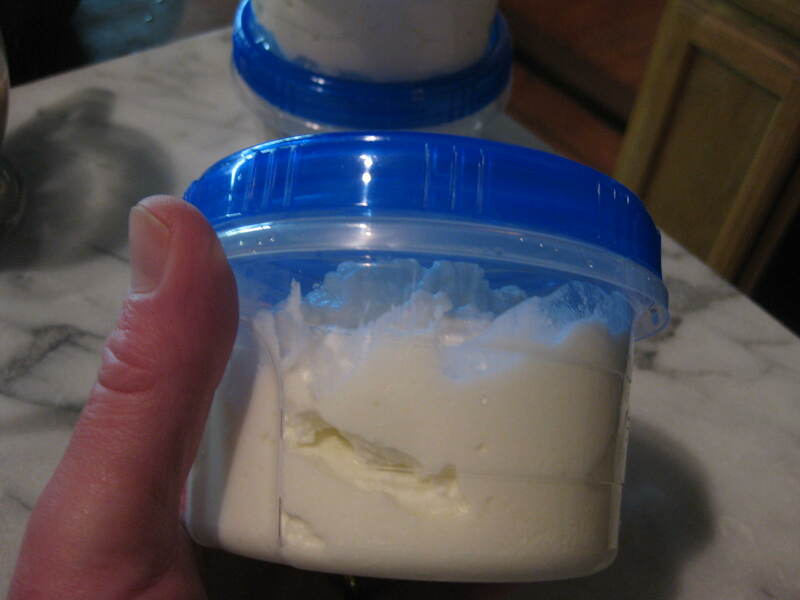 Storage — Homemade yogurt will keep for 7 days in the refrigerator. I store mine in the little PBA-free plastics tubs pictured above. Remember to save 3 tablespoons of your yogurt, so you can use it as the starter for your next batch. And I promise…you will definitely be making a second batch! 1. In a 6-quart, non-reactive pot, slowly heat milk to 180F. Remove from heat; let cool to 110F. 2. In a small bowl, mix 3 Tbsp (not more!) prepared yogurt with 1/2 cup cooled (110F) milk. Using an up-and-down motion, stir the milk-yogurt blend into the big pot of milk. Stir for 30 seconds. 3. Set the pot someplace where it can be kept at a warm temperature (between 105F and 110F) for seven hours. An unheated oven, with the light bulb turned on, is one option; otherwise set the pot on a heating pad set to the lowest setting. Cover the pot with a bath towel for added insultation. 4. When 7 hours has past, ladle the yogurt into a colander that you’ve laid with butter muslin or a big cloth napkin. Let drain until the yogurt reaches the desired consistency — it should be extra-thick, but still creamy — 1-2 hours. Ladle into airtight containers and refrigerate for up to 7 days. Be sure to save 3 Tbsp yogurt to use for your next batch. I love this yogurt!! I’d only ever had store bought until tonight…..never again! This is creamier,FAR tastier, less acidic and clearly much cheaper! (Which let’s face it…..in today’s world that is important!) Thank you for my yogurt education Kevin!! I’ll be making this often!!! Brenda – thanks for taste-testing! I make mine the same way up to a point–once the milk has cooled I pour it into individual wide-mouth quart jars, and inoculate each one. Our microwave oven is mounted above our stove and has a venting fan as well as small lights that shine down on the stovetop. The lights warm the inside of the microwave very nicely, so I put a towel in on the bottom and place the jars on top of it, right over the lights–6 hours later it’s done! We usually eat ours as is, but sometimes I strain it as well. I find I have to get a new store bought culture every so often–if I keep using my own for a culture, after a while it starts getting too tart. If only my oven had an interior light I could switch on! [I know, what a mad world?! I don’t know how I ended up with an oven like that… time to upgrade!] Might need to repurpose my growing lights after the spring starts are done… hehehe! Mary – Nice to meet another yogurt-maker! Sounds like you’ve discovered the perfect setup for keeping the milk warm as the yogurt cultures do their thing. Donna B. – Try the heating pad — it’s much, much cheaper than buying a new oven! I have one of those insulated lunch bags that happens to hold 2 quart sized canning jars plus one 1/2 pint canning jar. I fill one quart jar with boiling water, 1 quart jar with yogurt, and the leftover yogurt goes in the small jar. Since the recipe I follow uses 4 cups of milk, there is enough leftover from filling the quart jar to go into the small jar. Then I never forget to keep the 3 tablespoons for my next batch. All 3 of these jars fit into my lunch bag. I check after 4 hours and if the yogurt is not thickened enough yet, I remove the water jar and heat it up again and replace it into the bag. Terry – What a cool (or should I say “warm”?) system you have! And just think of all the money we save by making our own yogurt. At the supermarket today, I noticed a 16oz tub of Stonyfield Greek-style yogurt cost nearly $5.00. I made at least 48oz for $2.89 — the cost of the milk. I stumbled on this site about a week ago. I love your gardens! 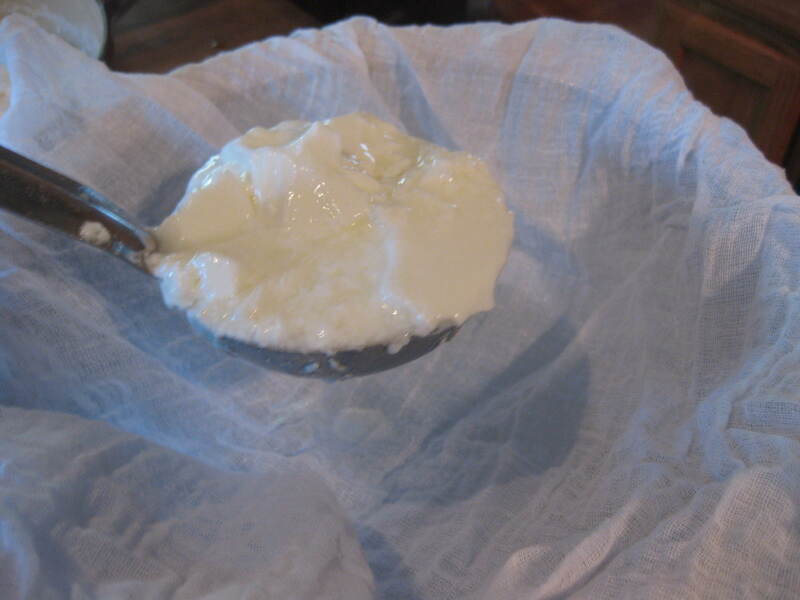 As for yogurt — Greek style yogurt is very easy to make. If you don’t want to go through the hassle of straining the stuff, you can stir in some powdered milk. However, I think the strained tastes better. I’ve started storing mine in little mason jars. Most places which sell the mason jars, also sell plastic, re-usable lids that fit the jars. In my experience, the glass jars are easier to clean plus it’s that much less plastic. Mason jar glass is tough stuff and I haven’t had any mishaps carting it to work with me. Off to try your homemade yogurt finally. Wish me luck! Hope you had a blast yesterday at your talk. I’m sure all attendees were delighted; I know I would be! I believe if you are using pasteurized milk, you only have to heat it to 110 degrees, everything has already been killed. You do have to heat raw milk to 180 degrees. I use raw milk I get at a local farm. I’ve made yogurt for several years and it’s great. I also use the oven light method. I’ve found it’s the easiest way for me. I just put the whole pot of cultured milk with the lid on it in the oven with the light turned on. I like my yogurt to be a bit more sour, so I leave it in for around 10 hours. And I strain it longer for a very thick Greek yogurt texture. Love your website! Connie – Your powdered milk idea is a good one, I think, especially for people who don’t have time to strain the whey. Cary – So glad you are trying the yogurt today! Thanks for asking about the talk I gave in Troy, NY. To my surprise (and horror!) it was sold-out. Had much fun at the event, especially during the Q&A session! Rebecca – I hope you are right about the 110 degrees for pasteurized milk, for this would save an awful lot of heating-time. Will investigate at once! Thanks so much for the yogurt recipe. I have just recently re-discovered Greek style yogurt and can’t get enough. I am so into making from scratch everything I can, and this is the easiest recipe ever. Thanks for this. My teenage son loves Greek yogurt and can eat a tub a day. He prefers vanilla to plain; I figure I can add some pure vanilla- but at what stage do you recommend? My yogurt is draining as I write! Your directions were very easy to follow, and the pictures were nice “proof” that I was doing it right! (meaning my yogurt process was matching yours!) We have a freestanding propane fireplace (looks a bit like a parlor stove/ wood stove) that is on a thermostat… that is what I put my covered pot of “cooked” milk on over night- worked like a charm! (I have french bread dough rising on it right now!) I see a weekly yogurt making in my future!!!! Thank you for this delicious money saving (and easy!) recipe! Is there a way to cut this recipe down? I live by myself and I don’t think I could eat all that yogurt every week. I used to make yogurt,growing up on a produce farm and then again when my kids were younger, I’m re-inspired to start again. I love greek yogurt. And your heating pad idea is great! Your instructions and pics would make Miss Muffet proud! Trish – You are so right. Hippie health-food is never a bad idea! Brenda Johnson – So glad the yogurt worked out for you — can’t wait to hear what you think of the taste/texture! Mary – You can certainly cut this recipe in half. But after you try the finished product, you’ll wish you’d made the larger amount! Liz – Thanks for the Miss Muffet seal of approval! I make keifer and pretty much do the same thing but use a store bought keifer culture from Canada, which is pretty pricey. Is this the same as keifer, then? I wonder what the difference is. Also in the keifer starter package it says to heat the first milk to 180 also and cool to 110, like you say. Each batch later I just add a cup of the old to plain unheated milk without going through the heating process every time. I like to place it next to my dehydrator and it ferments quickly but I do not always have it running. I make batches of this and put it in big mouth glass pitchers. We use liquid flavored stevia or my son uses a tart cherry concentrate. Your ideas and info are very helpful! I will be trying them. Kevin, I’ve looked and looked at different websites on yogurt making and only found one that said to heat pasteurized milk to only 110-120 degrees but I know I’ve made it before. It’s been a long time though because I’ve been buying raw milk for a while. I do have a book on cheesemaking from the Center for Essential Education and it says to heat pasteurized milk to 120 degrees for yogurt so that’s probably where I got my information. You could try it on a smaller quantity to see how it turns out. It should be fine. Carol – Apparently kefir has even more beneficial bacteria than yogurt. Hmmm…will explore this further! 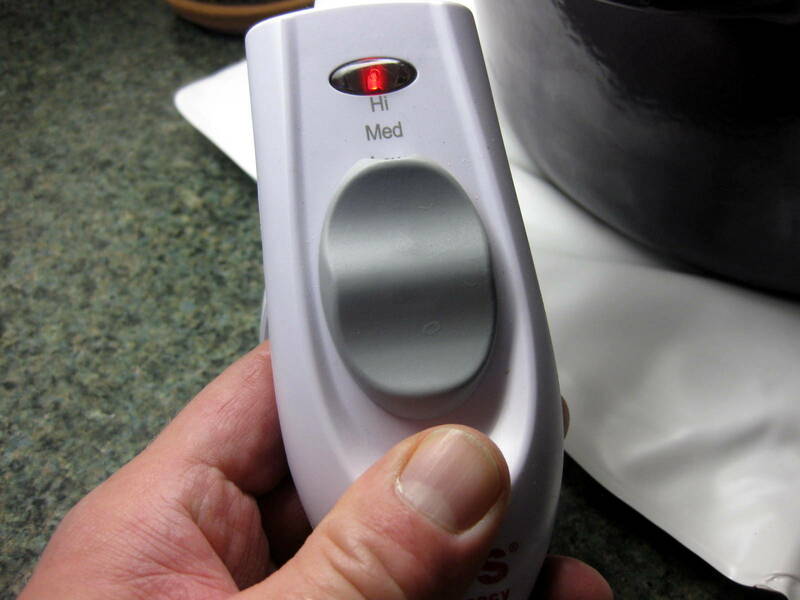 Rebecca – From what I’ve read, heating the (pasteurized) milk to 180 eliminates the bacteria which might otherwise interfere with the thickening process. So this must be more of a texture issue than a health issue. But I’ll keep investigating. This looks so good and seems so easy. I will definitely make it. I need mayonnaise next please! I have having so much fun here- love these recipes! I love your web site and have learned a lot from it. I miss yogurt so much – do you know of any successful recipes using anything other than milk? I also miss cheese – the soya ones always leave a bitter aftertaste, so any suggestions there would be truly appreciated!! janet sikora – You are too kind! Easy, creamy, fresh and dreamy homemade mayonnaise coming soon. AJ McLean – Although I’ve never made non-dairy yogurt, I did find this recipe for vegan yogurt. Let me know if it works out for you. I’m a failure. I made this recipe this morning and I just uncovered it to find not yogurt, but milk. I put the lid on the pot, wrapped it in a bath towel and stuck it in the oven with the light on, but I don’t think it kept it warm enough. When I uncovered it I stuck my themometer in and it registered less then 100 degrees. I’d really like to try this again, but I hate the idea of losing all that milk again. I suppose I could try the heating pad. I didn’t go that route today, b/c I wasn’t going to be home and my heating pad turns off automatically after its been on for awhile. Also, I was wondering, could I half the recipe? I don’t know if I would use that much yogurt in a week. Well, I enjoy your newsletter and site just the same. Thanks for all the good information. Diane – Well, you’re not a failure…your oven is! Next time, do what I do: make the yogurt at night, and then set the pot on a heating pad. Trust me, you’ll have yogurt the next morning! Since your heating pad shuts itself off, you’ll need to obtain a less high-tech one. I use a cheap, $20 heating pad, which I purchased from a drug store. The pad does not shut itself off. And set at the lowest setting, it keeps the milk at the right temperature all night long. Not once has this method failed me. Oh. You can definitely cut the recipe in half. Thi sis fabulous! Can I use goat’s milk to make it instead of cow’s milk? Do you have a link on here to make mozzarella? That is my fav cheese. I would like to make that out of goat’s milk as well. This is a great source of info! Keep up the good work! May – Yes, you can use goat’s milk to make this yogurt. And how delicious THAT would be! 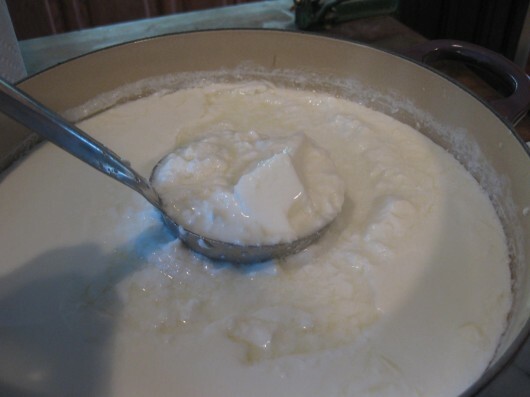 Concerning mozzarella — I use this recipe. I tried your homemade Greek yogurt yesterday, it is fabulous, will never buy yogurt again. And so easy to make. It is creamy and smooth and doesn’t have that acidic taste the store kind has. Thanks so much, I love your site. I’m lactose intolerant and love greek yogurt. Can I use Lactose Free milk for this recipe or will the yogurt cultures take care of the lactose in regular milk? Karen Killam – So glad you tried this recipe and like it. I’m with you — I’ll never buy commercial yogurt again! Sue – According to numerous sources I checked, including this one, “the live active cultures [in yogurt] create lactase, the enzyme lactose-intolerant people lack, and another enzyme contained in some yogurts (beta-galactosidase) also helps improve lactose absorption in lactase-deficient persons. Janet and Leslie – There is a link for “Vegan Yogurt” in comment #24 above. Hope that recipe works out for you — I have not tried it. 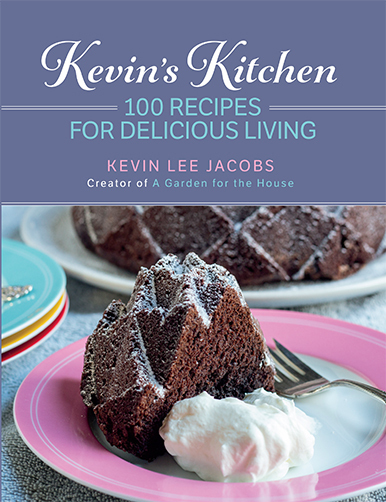 Hi Kevin-I made the yogurt yesterday and it turned out great! My only question I have is about the large amount of whey I was left with and consequently the relatively small amount of finished yogurt. I used fat free milk and was wondering if that was the reason? I have about two quarts of whey and a little more than two quarts of yogurt. Do you know of any other use for whey? Thanks! I love your website! Margie – Delicious, yes? You might have over-drained your yogurt (as I sometimes do). The leftover whey — which is incredibly nutritious — can be used in place of water for bread-baking, or added it to soup. I know some cheese-makers use whey to make ricotta. Wow, is your milk ever reasonably priced!! Up here that much organic milk would cost over twelve dollars. I too make my own yogurt and will never buy again. I use Raw milk from a dairy up the road here in Arizona. I keep the heat at 110 and my yogurt remains raw and delish, I do have a little more whey than if I heated a little more but Iike the benefits of all the good bacteria of the fermentation. I was adding a hint for yor extra whey, I am suprised that you don’t use it in your garden! I save half the whey for my hubs and kids smoothies and chicken stock and use the rest on my flowers and trees, it is fantastic in the garden, adds some great bacteria and nutrients to the soil and boy the blooms coming off my roses are fantastic during the spring and summer! I have not found that it invites pests and actually impedes them. I have really enjoyed reading your articles, I came upon your site thru pinterest and have started following you and all these great tips!! I make my yogurt just as you do but …. I preheat my oven to 200 degrees and then turn it off before placing my bowl of yogurt wrapped in a bath towel in the oven for 10 hours. Always turns out perfecto !!! Love it and Love your site!!! going to have to try this . love yogurt. but can you add fruit to it and store it O.K. after you make it? Quick question, when you use the whey in bread, do you have a ratio with other liquids or replace the liquids completely with the whey? 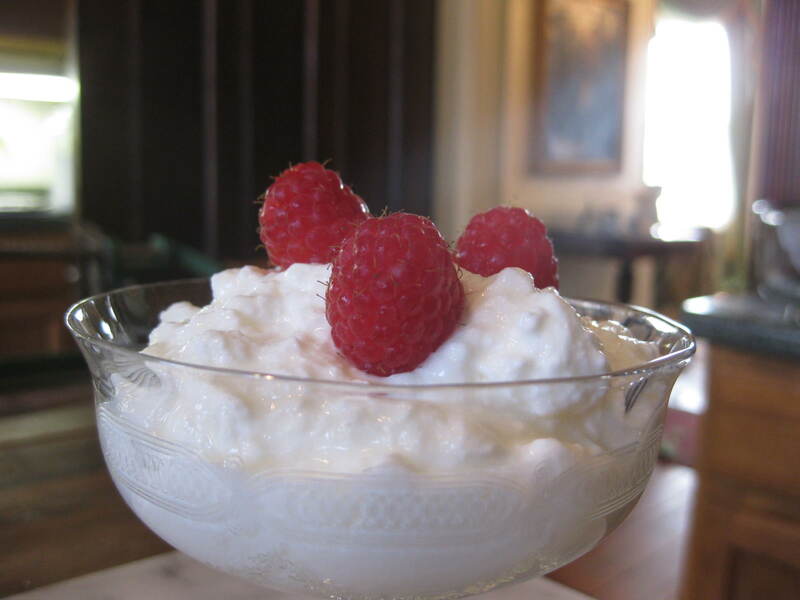 Suzan – Not sure how homemade yogurt will “keep” with fruit or jam added. Probably the best plan is to add the fruit when you are serving the yogurt. Sylvia – I’ve used whey to replace the water in some of my bread-baking adventures. But from what I’ve read, you can replace any and all liquids in a bread recipe entirely with whey (1:1 ratio). Maybe other bakers will “whey-in” on this idea. chuckle chuckle love a good pun, thanks for that. I am going to try that this afternoon with the 1:1. I’ve been making yoghurt like this for nearly a year now – I wrap my jars in large towels, then store them in a cooler with another jar of just boiled water. If a cooler keeps things cool, it can keep things warm right? As for occasionally having a bit too much yoghurt around… well, that’s where the blender comes in – I freeze half of my bananas and berries as soon as I get them, since I don’t care to water down smoothies with ice. I make a bunch of smoothies, different flavors, and freeze them in Popsicle molds. If I am out of those, then pudding molds with a Popsicle stick works great. Believe me – adults, kids and even dogs love yoghurt smoothies on hot days. I use this same recipe only half as much and I use raw milk, skip the heating to 180 step. I then sink my 1/2 gallon mason jar into my hot tub for 7 hrs. It works great. I contemplated trying the heating pad method but my tub is always around 104-105. Susie – What a great idea — using a cooler to keep your yogurt (or yoghurt) warm. Necessity is the mother of all invention, right? I know a little beagle named Lily who would love one of the smoothies you mentioned. Of course, I’d like one, too! Holly – Hot tub — another great way to keep the yogurt at the proper temperature! I like that idea so much better than mine! Was planning on getting a cheapo foam cooler and just suspending a chicken brooder heat lamp above it. But it could take awhile to get the temp to be correct for the yogurt. Besides, I am chea…er…frugal and the hot water in the other jar would save my electric bill. I read this recipe and thought “it can’t be this easy!” Well, IT IS and IT’S DELICIOUS! A couple of hints … I only make 1 qt at a time (I’m the only one that eats it here) and I like it drained a bit so I had some of those Healthy Choice Steamers 2 part dinner bowls I’d saved for whatever reason. I put a coffee filter in 5 of them and divide the completed yoghurt equally amongst them and let them drain for 1 1/2 to 2 hours. I don’t keep the whey but you get quite a bit and I see someone else hinted to use it in your next batch of bread. I had just bought the milk and the last yoghurt (for starter) that I’m ever going to buy and on my way home I stopped by a Yard Sale and MIRACULOUSLY there was a hardly ever used yoghurt maker. All it is is a warmer and 5 cups … perfect for making one quart! I only gave $1 for the yoghurt maker so I think I really got a deal!!!!! I read that if you buy pasteurized milk you don’t need to take it to 180. Just go to 110, add your starter and start processing!!!!! This is the BEST GREEK YOGHURT IN THE WORLD! Thanks, Kevin! You’ve changed my life for the better! Usually I heat the milk to 180 degrees and then immediately put it in an ice water bath to bring the temperature down to 110 degrees and then add my yogurt starter. I then put the pot on a heating pad for 7 hours, etc. If you only heat it to 110 to begin with, do you skip the ice water bath, and if not, what temperature do you bring the yogurt down to before putting it on the heating pad (or whatever source you keep it warm)? If your yogurt doesn’t thicken and you still have milk after the incubation period, DON’T DUMP IT!!! Put it in your crockpot on high to seperate the curds and whey then drain it in a muslin or pantyhose lined colander at least 2 hours. Say CHEESE! I have made this yogurt every week up at my daughters for the last three weeks. They love it! I only make 1/2 because she doesn’t have a nonreactive pan big enough for 1 gal. So I make it twice a week. I turn the oven light on when I start to heat the milk to 180, by the time it is ready to go in I just put the pan in the oven close to the light and never wrapped in a towel. It is fab u lous. Made one batch and put 2 tsp vanilla in it while milk was heating. Wouldn’t do it again. My daughter didn’t like it. I don’t even need to read direction on how to make it any more. It is so easy a child can do it with an adult overseeing. Hi Kevin, I realize this is an old post but wanted to pur this out there…. I often make my own yogurt using a heating pad. I learned through the Specific Carbohydrate Diet that if you cook it for 24 hours you eliminate the lactose. And for those needing to be dairy free this is the way to go. And everything I have read on making your own yogurt says to heat to 180 degrees. Pat Torgrimson – Old post, but I still read all comments. Thanks for posting yours. What an interesting observation concerning lactose! I heat the milk in my crockpot to 180 degrees. It takes about 2 hours or so. When it reaches the correct temperature I remove the crock from the base, take off the lid and let it cool to 110 degrees. At that point I put the lid back on and wrap the crock in a heavy beach towel and put it in the oven with the light on overnight. In the morning I put the crock in the refrigerator to cool completely, 3 hours or in my case all day while I’m at work. Then I put it in the colander lined with a thin dish towel or cheesecloth to drain. I have successfully added crushed pineapple (very well drained) to the entire batch and had it keep very well. I found this method on a blog called “One Good Thing by Jillee” and it works well for me. Thank you for the recipe – and science lesson! I’m going to make this tomorrow after I get back from the store! Kate – Let me know how the yogurt turns out for you. I’m hooked on the stuff! I freeze the yogurt I’m not going eat in a timely manner with berries or whatever then pop the frozen cubes into blender with smoothies. Yum! Kevin, thanks for the reminder on how to make yougart. When my children were little, I used to make it all the time. I even had a yougart maker. I haven’t idea where that went! But what I really wanted to share, is back in the early 70’s, I traveled all around Europe. (Yes, on $5.00 a day!). 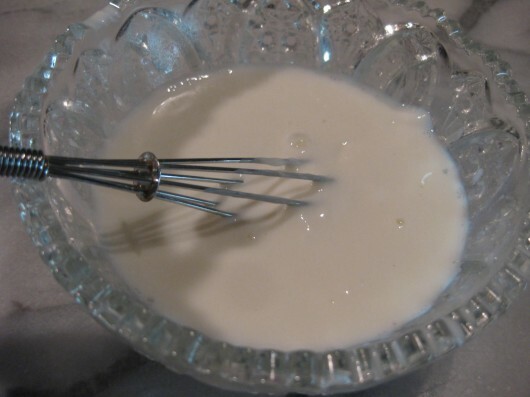 When I stayed with a family in Austria, they made many things with what they called ‘quark’. Now I know, it must have been Greek yougart-homemade, of course. I could never find it in the US. Now that I recognize it for what it is, I will have to make my own and pull out that ancient diary I kept and lookup all the recipes I wrote down that called for it. If I find an especially good one, I wll share it with you! 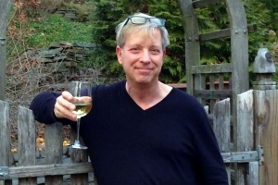 Thanks again for a lovely Sunday read.im sitting on my deck here in Michigan in the shade of the river birches we planted, listening to the wrens nd the wood thrushes. The air feels like silk! Nothing is lovelier than a summer day in West Michigan! My mother used to make yogurt when we were growing up but we didn’t strain it. In the years since, I’ve grown to love Greek yogurt – which I was delighted to learn was the very same quark that I’d loved when I lived in Germany. I’m looking forward to making my own. Thanks for sharing the technique, Kevin. I’ve been making yogurt all summer, not that long so i’m still a novice. It is incredibly easy and so delicious . I only buy yogurt now if I’ve forgotten to save some starter. I use a small cooler which is warmed with hot water prior to adding the jars. Holds 2 mason jars wrapped in towels perfectly. I let it incubate overnight and strain the next day. Love it. How can I make yogurt using almond milk? I am dairy-free!! I’ve now made this recipe once a week for the last 5 weeks – I love it! I strain my yogurt really well and then add some homemade jam or store bought fruit spread to make a flavored cup of yogurt. I especially enjoy this at night when I’m wanting something sweet. I’ve also added frozen blueberries and it makes an almost frozen dessert. I feel empowered making my own yogurt – Thanks Kevin!!! Thanks for the recipe. I see it is an old post but hopefully you will see it. Can you add flavors to this method other than Vanilla, Lemon etc.? I’ve made yogurt for going on nearly 40 years, off and on. I’ve never had a failure, but I use a yogurt maker. IMO, the all-time best breakfast, snack, or dessert is plain yogurt with a couple of drops of vanilla extract, 2 Equal packets, and a nice firm banana sliced into coins stirred in. Heavenly. Once again, thank you, Kevin, for your great site. Hi Kevin! Just recently found your lovely site and am enjoying it immensely! I too use an old cooler to incubate my yogurt in. It is a regular hard plastic cooler with locking lid. I place my glass mason jars in the cooler then fill the cooler halfway up the jars with water around 120. Let sit overnight and done! I find it will last almost a month in the fridge but we usually eat it up in a couple of weeks. The ratio I use is 1/2 cup yogurt to 2 quarts of milk but I am curious to see if I can reduce that as you have and still get good results! @ Patsy Price..one of the ways we love to eat our yogurt is to put a big spoon of homemade strawberry jam in a dish then yogurt on top. You have just made “fruit-bottomed” yogurt!! I ignored this post for quite some time thinking it would be too difficult. I recently read through it, found it to be quite simple, made it – and I’m never going back to store bought yogurt again! Absolutely delicious!! And easy! I have a Cabela’s Commercial Dehydrator that I incubate my homemade goats milk yogurt in. I can set the time and temp. It works perfect every time! Kevin, you mentioned maybe wanting to make Kefir and for anyone else interested in making Kefir, google Dom’s Kefir, his website has more than you want to know about making Kefir. I’ve been making it for several years now and drink about two quarts a day. For anyone wanting to make it, purchase living Kefir grains (they look kind of like rubbery translucent cottage cheese) online by googling Kefir Grains and you will probably even find plenty of people willing to even give you some, you only need about two tablespoons to make your first Kefir and then the grains continue reproducing and you never have to obtain more of them, they are the true Kefir starter. The expensive powdered package starter that some people use doesn’t make the ‘real’ Kefir nor does it contain all the benefits of real Kefir. Kevin, I love your website and have learned so much from you, thank you for all your effort. I’ve made yogurt before in a yogurt maker, but I’ve never strained it to make Greek yogurt. I agree that Greek is much better than “traditional” yogurt–that thick, creamy texture is delightful. One thing I must point out in your instructions: The term “PABA” -free that you used for your plastic container should probably be “BPA”-free. PABA is used in some sunscreens!. BPA is found in some plastics. Ha–my OCD is showing! Mu husband makes our Greek yogurt all the time 🙂 We use a cooler with hot water for about 8 hours and viola! Greek Yogurt 🙂 So yummy!!! Oh Kevin! Each time I receive your blog, I think maybe I don’t have time to read and enjoy it because I am a usually busy person. But then I open it anyway and 45 minutes later, I am simply and purely inspired. How can I ever wonder again “What shall I prepare for food today?” without going to your blogsite and coming away ready to address any meal or snack?